For other uses, see Hybrid. A mule is a sterile hybrid of a male donkey and a female horse. 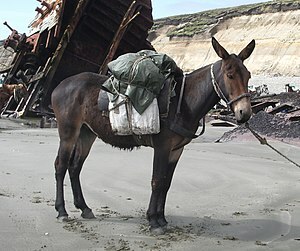 Mules are smaller than horses but stronger than donkeys, making them useful as pack animals. Hybridisation can occur in the hybrid zones where the geographical ranges of species, subspecies, or distinct genetic lineages overlap. For example, the butterfly Limenitis arthemis has two major subspecies in North America, L. a. arthemis (the white admiral) and L. a. astyanax (the red-spotted purple). The white admiral has a bright, white band on its wings, while the red-spotted purple has cooler blue-green shades. Hybridisation occurs between a narrow area across New England, southern Ontario, and the Great Lakes, the "suture region". It is at these regions that the subspecies were formed. Other hybrid zones have formed between described species of plants and animals. Hybrid vigour: Salvia jurisicii x nutans hybrids (top centre, with flowers) are taller than their parents Salvia jurisicii (centre tray) or Salvia nutans (top left). The London plane, Platanus × acerifolia is a natural hybrid, popular for street planting. Oase 2 skull may be a human- Neanderthal hybrid. 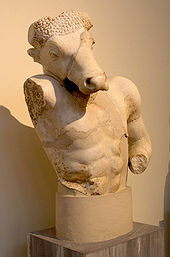 The Minotaur of ancient Greek mythology was (in one version of the myth) supposedly the offspring of Pasiphaë and a white bull. ^ "Hybrid". Online Etymology Dictionary. Retrieved 28 June 2017. ^ Runge, Marschall S.; Patterson, Cam, eds. (2006). Principles of Molecular Medicine. Humana Press. p. 58. ISBN 978-1-58829-202-5. ^ Thompson, K. F. (1964). "Triple-cross hybrid kale". Euphytica. 13: 173. doi: 10.1007/BF00033306 (inactive 2019-02-22). ^ "Topcross". Merriam-Webster. Retrieved 20 March 2017. ^ McCarthy, Eugene M. "Hybrid Populations". Macroevolution. Retrieved 20 March 2017. ^ Toogood, A., ed. (1999). Plant Propagation. American Horticultural Society. p. 21. ISBN 978-0-7894-5520-8. ^ a b c d e f Allendorf, Fred (2007). Conservation and the Genetics of Populations. Blackwell. p. 534. ^ a b Sirks, M. J. (2013). General Genetics. Springer. p. 408. ISBN 978-94-015-7587-4. ^ De Vries, Hugo (1901–1903). Die mutationstheorie. Vol I and II. Von Veit, Leipzig. ^ de Vries, Hugo (January 1919). 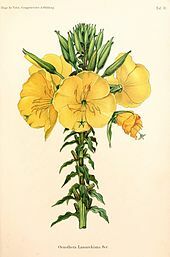 "Oenothera rubrinervis; A Half Mutant". Botanical Gazette. 67 (1): 1–26. doi: 10.1086/332396. JSTOR 2468868. ^ Allendorf, Fred (2007). Conservation and the Genetics of Populations. Blackwell. pp. 421–448. ^ Keeton, William T. (1980). Biological Science. Norton. p. A9. ISBN 978-0-393-95021-2. ^ Arnold, M.L. (1996). Natural Hybridisation and Evolution. Oxford University Press. p. 232. ISBN 978-0-19-509975-1. ^ Johnsgard, Paul A. (1983). "Hybridisation & Zoogeographic Patterns in Pheasants". University of Nebraska - Lincoln. p. 5. Retrieved 20 March 2017. ^ Giudice, Giovanni (2012). Developmental Biology of the Sea Urchin Embryo. Elsevier. p. 171. ISBN 978-0-323-14878-8. ^ a b McCarthy, Eugene M. (2006). Handbook of Avian Hybrids of the World. Oxford University Press. pp. 16–17. ^ Rong, R.; Chandley, A. C.; Song, J.; McBeath, S.; Tan, P. P.; Bai, Q.; Speed, R. M. (1988). "A fertile mule and hinny in China". Cytogenetics and Cell Genetics. 47 (3): 134–9. doi: 10.1159/000132531. PMID 3378453. ^ Baker, H. G. (1959). "Reproductive methods as factors in speciation in flowering plants". Cold Spring Harb Symp Quant Biol. 24: 177–191. doi: 10.1101/sqb.1959.024.01.019. PMID 13796002. ^ Strickberger, M. 1978. Genética. Omega, Barcelona, España, p.: 874–879. ISBN 84-282-0369-5. ^ Futuyma, D. 1998. Evolutionary biology (3ª edición). Sinauer, Sunderland. ^ a b Gornicki, Piotr; et al. (2014). "The chloroplast view of the evolution of polyploid wheat". New Phytologist. 204 (3): 704–714. doi: 10.1111/nph.12931. PMID 25059383. ^ Esch, Mary (31 May 2011). "Study: Eastern wolves are hybrids with coyotes". Boston.com. Associated Press. Retrieved 22 March 2017. ^ Rutledge, Linda Y.; et al. (2012). "Conservation genomics in perspective: A holistic approach to understanding Canis evolution in North America" (PDF). Biological Conservation. 155: 186–192. doi: 10.1016/j.biocon.2012.05.017. ^ Chambers, Steven M.; et al. (2012). "An account of the taxonomy of North American wolves from morphological and genetic analyses". North American Fauna. 77: 1–67. doi: 10.3996/nafa.77.0001. ^ Soubrier, Julien; et al. (18 October 2016). "Early cave art and ancient DNA record the origin of European bison". Nature Communications. 7: 13158. doi: 10.1038/ncomms13158. PMC 5071849. PMID 27754477. ^ Daley, Jason. "Cave Paintings Help Unravel the Mystery of the 'Higgs Bison'". Smithsonian. Retrieved 20 October 2016. ^ Hancock, James F. (2004). Plant Evolution and the Origin of Crop Species. CABI Publishing. ISBN 978-0-85199-685-1. ^ Rieseberg, Loren H. (1997). "Hybrid Origins of Plant Species". Annual Review of Ecology, Evolution, and Systematics. 28: 359–389. CiteSeerX 10.1.1.718.9871. doi: 10.1146/annurev.ecolsys.28.1.359. ^ "Hybrid bear shot dead in Canada". BBC News. 13 May 2006. ^ Rieseberg, Loren H.; Margaret A. Archer; Robert K. Wayne (July 1999). "Transgressive segregation, adaptation and speciation". Heredity. 83 (4): 363–372. doi: 10.1038/sj.hdy.6886170. PMID 10583537. ^ Smith, C. Wayne (2004). Corn: Origin, History, Technology, and Production. Wiley. p. 332. ^ McCarthy, Eugene M. (2006). Handbook of Avian Hybrids of the World. Oxford University Press. p. 17. ISBN 978-0-19-518323-8. ^ Darwin, Charles (1868). Variation of Animals and Plants under Domestication. II. p. 125. ^ Spicer, J. W. G. (1854). "Note on hybrid gallinaceous birds". The Zoologist. 12: 4294–4296. ^ a b c Allendorf, Fred W.; Leary, R. F.; Spruell, P.; Wenburg, J. K. (2001). "The problems with hybrids: setting conservation guidelines". Trends in Ecology & Evolution. 16 (11): 613–622. doi: 10.1016/S0169-5347(01)02290-X. ^ Ehrlich, Paul; John Holdren (26 March 1971). "Impact of population Growth". Science. 171 (3977): 1212–1216. doi: 10.1126/science.171.3977.1212. ^ Vitousek, Peter; et al. (1997). "Introduced Species: A Significant Component of Human-cause Global Change". New Zealand Journal of Ecology. 21 (1): 1–16. ^ Mooney, H. A.; Cleland, E. E. (2001). "The evolutionary impact of invasive species". PNAS. 98 (10): 5446–5451. doi: 10.1073/pnas.091093398. PMC 33232. PMID 11344292. ^ Rhymer, J. M.; Simberloff, D. (1996). "Extinction by Hybridization and Introgression". Annual Review of Ecology and Systematics. 27: 83–109. doi: 10.1146/annurev.ecolsys.27.1.83. ^ Farmer, B. H. (1986). "Perspectives on the 'Green Revolution' in South Asia". Modern Asian Studies. 20 (1): 175–199. doi: 10.1017/s0026749x00013627. ^ Griesbach, Robert J. (1986). "That Reciprocal Cross — Is It a Mule or Hinny?" (PDF). Awards Quarterly. 17 (3): 149. ^ Bulliet, R.W. (1975). The Camel and the Wheel. Columbia University Press. pp. 164–175. ^ Bhanoo, Sindya (2014-01-13). "Scientists Find Rare Hybrid of Two Other Dolphin Species". The New York Times. Retrieved 20 January 2014. ^ "British Mule/Hybrid". Severn Counties Foreign & British Bird Society. Retrieved 19 March 2017. ^ "Godzilla vs. Godzilla—How the Chinese Giant Salamander is taking a toll on its Japanese Comic Counterpart". Amphibians.org. Retrieved 12 March 2017. ^ Voloder, Dubravka (3 January 1012). "Print Email Facebook Twitter More World-first hybrid sharks found off Australia". ABC News. Retrieved 5 January 2012. ^ Hall, H. Glenn; Zettel-Nalen, Catherine; Ellis, James D. "African Honey Bee: What You Need to Know". University of Florida IFAS Extension. Retrieved 19 March 2017. ^ Grula, John W.; Taylor, Orley R. (1980). "The Effect of X-Chromosome Inheritance on Mate-Selection Behavior in the Sulfur Butterflies, Colias eurytheme and C. Philodice". Evolution. 34 (4): 688–95. doi: 10.2307/2408022. JSTOR 2408022. ^ Mallet, J.; Beltrán, M.; Neukirchen, W.; Linares, M. (2007). "Natural hybridization in heliconiine butterflies: The species boundary as a continuum". BMC Evolutionary Biology. 7: 28. doi: 10.1186/1471-2148-7-28. PMC 1821009. PMID 17319954. ^ Brower, A.V.Z. (2011). "Hybrid speciation in Heliconius butterflies? A review and critique of the evidence". Genetica. 139 (2): 589–609. doi: 10.1007/s10709-010-9530-4. PMC 3089819. PMID 21113790. ^ Goulet, Benjamin E.; Roda, Federico; Hopkins, Robin (2016). "Hybridization in Plants: Old Ideas, New Techniques". Plant Physiology. 173 (1): 65–78. doi: 10.1104/pp.16.01340. PMC 5210733. PMID 27895205. ^ McNeill, J.; et al. (Barrie, F.R. ; Buck, W.R.; Demoulin, V.; Greuter, W.; Hawksworth, D.L. ; Herendeen, P.S. ; Knapp, S.; Marhold, K.; Prado, J.; Prud'homme Van Reine, W.F. ; Smith, G.F.; Wiersema, J.H. ; Turland, N.J.) (2012). International Code of Nomenclature for algae, fungi, and plants (Melbourne Code) adopted by the Eighteenth International Botanical Congress Melbourne, Australia, July 2011. Regnum Vegetabile 154. A.R.G. Gantner Verlag KG. ISBN 978-3-87429-425-6. ^ "'Columbia' and 'Liberty' Planetree" (PDF). U.S. National Arboretum. 1999. Retrieved 19 March 2017. ^ Gledhill, David (2008). The Names of Plants. Cambridge: Cambridge University Press. p. 23. ISBN 9780521685535. ^ Warschefsky, E.; Penmetsa, R. V.; Cook, D. R.; von Wettberg, E. J. B. (8 October 2014). "Back to the wilds: Tapping evolutionary adaptations for resilient crops through systematic hybridization with crop wild relatives". American Journal of Botany. 101 (10): 1791–1800. doi: 10.3732/ajb.1400116. PMID 25326621. ^ Stace, C. A. (1987). "Triticale: A Case of Nomenclatural Mistreatment". Taxon. 36 (2): 445–452. doi: 10.2307/1221447. JSTOR 1221447. ^ Darrow, G.M. (1955). "Blackberry—raspberry hybrids". Journal of Heredity. 46 (2): 67–71. doi: 10.1093/oxfordjournals.jhered.a106521. ^ Carrington, Sean; Fraser, HenryC (2003). "Grapefruit". A~Z of Barbados Heritage. Macmillan Caribbean. pp. 90–91. ISBN 978-0-333-92068-8. ^ "Mint Genomics Resource: Species". Lange Laboratory, Washington State University. Retrieved 20 March 2017. ^ Hull, R. (2009). "A Short Guide to the London Plane" (PDF). Retrieved 2 February 2016. ^ Venables, B. (4 March 2015). 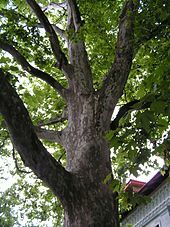 "The Secret History Of The London Plane Tree". Londonist. Retrieved 2 February 2016. ^ "Legacy Bulbs Six". Pacific Bulb Society. Retrieved 20 March 2017. ^ "Lilium Hybrids". Pacific Bulb Society. Retrieved 22 March 2015. ^ "University of Colorado Principles of Genetics (MCDB 2150) Lecture 33: Chromosomal changes: Monosomy, Trisomy, Polyploidy, Structural Changes". University of Colorado. 21 November 2000. Archived from the original on 14 October 2012. ^ Burr, Benjamin; Burr, Frances (2 October 2000). "How do seedless fruits arise and how are they propagated?". Scientific American. ^ Vernot, B.; Akey, J. M. (2014). "Resurrecting Surviving Neandertal Lineages from Modern Human Genomes". Science. 343 (6174): 1017–1021. doi: 10.1126/science.1245938. PMID 24476670. ^ Green, R.E. ; Krause, J.; Briggs, A.W. ; Maricic, T.; Stenzel, U.; Kircher, M.; et al. (2010). "A Draft Sequence of the Neandertal Genome". Science. 328 (5979): 710–722. doi: 10.1126/science.1188021. PMC 5100745. PMID 20448178. ^ Huerta-Sánchez, Emilia; Jin, Xin; Asan; Bianba, Zhuoma; Peter, Benjamin M.; Vinckenbosch, Nicolas; Liang, Yu; Yi, Xin; He, Mingze; Somel, Mehmet; Ni, Peixiang; Wang, Bo; Ou, Xiaohua; Huasang; Luosang, Jiangbai; Cuo, Zha XiPing; Li, Kui; Gao, Guoyi; Yin, Ye; Wang, Wei; Zhang, Xiuqing; Xu, Xun; Yang, Huanming; Li, Yingrui; Wang, Jian; Wang, Jun; Nielsen, Rasmus (2014). "Altitude adaptation in Tibetans caused by introgression of Denisovan-like DNA". Nature. 512 (7513): 194–197. doi: 10.1038/nature13408. PMC 4134395. PMID 25043035. ^ Duarte, Cidalia; et al. (22 June 1999). "The early Upper Paleolithic human skeleton from the Abrigo do Lagar Velho (Portugal) and modern human emergence in Iberia". PNAS. 96 (13): 7604–7609. doi: 10.1073/pnas.96.13.7604. PMC 22133. PMID 10377462. ^ Bower, Bruce (5 October 2016). "Animal hybrids may hold clues to Neandertal-human interbreeding". Sciencenews. ^ Fu, Qiaomei; et al. (13 August 2015). "An early modern human from Romania with a recent Neanderthal ancestor". Nature. 524 (7564): 216–219. doi: 10.1038/nature14558. PMC 4537386. PMID 26098372. ^ Wang, C.C. ; Farina, S.E. ; Li, H. (2013) [Online 2012]. "Neanderthal DNA and modern human origins". Quaternary International. 295: 126–129. doi: 10.1016/j.quaint.2012.02.027. ^ Condeme, Silvana; et al. (27 March 2013). "Possible Interbreeding in Late Italian Neanderthals? New Data from the Mezzena Jaw (Monti Lessini, Verona, Italy)". PLoS ONE. 9 (1): e59781. doi: 10.1371/journal.pone.0059781. PMC 3609795. PMID 23544098. ^ "Minotauros". Theoi. Retrieved 20 March 2017. ^ "Bestiary". Theoi. Retrieved 20 March 2017. ^ Kugel, James L. (2009). Traditions of the Bible: A Guide to the Bible As It Was at the Start of the Common Era. Harvard University Press. p. 198. ISBN 9780674039766. ^ Kugel, James L. (1997). The Bible as it was. Harvard University Press. p. 110. ISBN 9780674069411. ^ Boyd, Gregory A. God at War: The Bible & Spiritual Conflict. IVP Academic. p. 177. 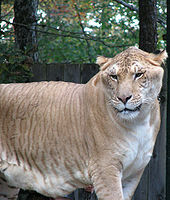 Wikimedia Commons has media related to Hybridization. Scientists Create Butterfly Hybrid – Creation of new species through hybridization was thought to be common only in plants, and rare in animals.